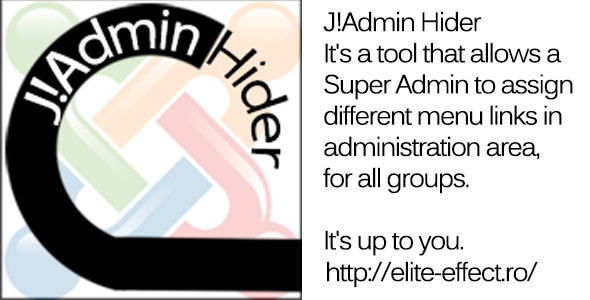 J!Admin Hider It’s a plugin that allows a Super Admin to assign different menu links in administration area, for all groups. – Then go and edit for this second group, what are the menu links in administrator that you want the users from Customer group to see. This is nice, if you dont want them to see the extensions menu, or the help menu..but if the user knows the full address of the hidden menu, he will be able to access it directly. The concept was started when I realise a customer that I give him Publisher permissions, but in some components (like VirtueMart) his access is somehow limited. I want to give full access to a customer for entire site, but I want him to see only relevant links. This entry was posted in Uncategorized and tagged administrator menu hider, database, feeds, forms, joomla, media, php, scripts, sliders by Acty. Bookmark the permalink.